At times when an item needs to be weighed, it makes more sense logistically to take the scale to the item, rather than the other way around. Thankfully, scales are being designed and produced to make that a viable and affordable possibility. Luckily, designers saw the need for many different industrial scales made on a portable level. There is now one to fit almost any foreseeable need. What these scales gain in portability, they match in accuracy. Nothing is lost transitioning from the traditional form to the portable incarnation. If anything was lost, the purpose would be defeated, so designers have taken great care to make sure all design and manufacturing is held to the highest of standards. Portable industrial scales are designed to maintain durability in even harsh conditions. The same thought and care go into their designs and manufacturing as does in the making of a traditional scale. They also boast the most current technology available. Easy to read digital displays make reading measurements an easy task. Internal memory holds measurements to be recalled at a later time. 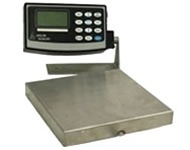 Portable industrial scales are available in many sizes and forms, ready to meet any need. Platform scales are made to last. They are designed with four stainless steel load cells that have been welded into the frame. The feature provides great shock resistance. Drums can easily be weighed on industrial drum scales that have been outfitted with a ramp and stainless steel sensors. The easiest to use drum scales do not have side rails. This allows bigger objects to be weighed without the rails present to impede the loading process. They are built with a low profile to make it even easier to load the item. Great sensor technology provides accurate weight measurements. Floor scales provide a measure of portability for their users. These scales are made of tough and durable steel, or even stainless steel. Large digital screens provide an easy to read display. Floor scales are available in many sizes and weight capacities. Explosive environments can make the weighing process a difficult one. To make the process easier many scales have been made to meet the different hazardous area divisions, groups and classes. These scales provide great weight resolution. Some are capable of 0.002 lb resolution. This scale also boasts no moving parts to make for an easy maintenance measuring tool. Portable scales are also available for smaller objects. High resolution scales with super sensitivity and surface wave technology couple portability with highly accurate measurements. LCD display screens come equipped for a super easy read. These high resolution scales provide an accuracy of 0.005%. Its display resolution is up to 1 part in 500,000 while its internal resolution is up to 1 part in 2 million. For parts counting, mixing and formulation, there are scales made with super sensitivity and surface acoustic wave technology. These scales use displacement rather than stress or strain. This reduces error occurrences. The high resolution technology provides a sensitivity that is, on average, 20 times higher than traditional scales.